In Oklahoma, the Board of ENVIA Energy has suspended operations at the Oklahoma City plant and is undertaking a review of strategic alternatives in order to preserve the value inherent in the facility. This decision was driven by financial circumstances following a leak at the plant, as announced on 15 May 2018. ENVIA’s investigation into the leak identified the ancillary coolant system as the root cause. During this period ENVIA has been operating the plant at reduced capacity using a single reactor to generate products, but in this configuration the plant does not meet the specific process energy requirements applicable under its RFS pathway to generate RINs, which has further exacerbated ENVIA’s operating losses. Such status would be expected to continue until the second reactor was restored to operation. ENVIA has provided the JV partners with additional financial information including the projected timing of the insurance settlement, and the projected costs to implement a full plant remedy to sustainable and reliable cash generation. 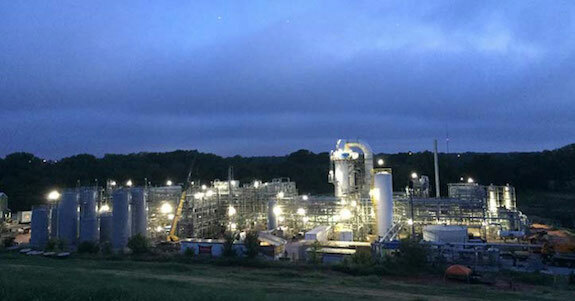 “The Velocys Board fully supports the ENVIA Board’s decision given the likely capital requirements of the plant and believes that Velocys’ capital is better invested in progressing its Mississippi Biorefinery and UK waste to jet projects, which have the potential to generate significant value for shareholders. · Demonstrated successful operation of Velocys’ Fischer-Tropsch technology from commissioning and start-up through full commercial operation, including two years of operations without a lost time accident. · Enabled extensive data capture that is commercially important to Velocys, as it progresses its Mississippi Biorefinery and UK waste to jet projects and licensing its technology to third parties. · Sold over 10,000 barrels of products to commercial offtakers. · The successful manufacture of fuels that have generated RIN credits under the Renewable Fuel Standard (RFS), another key commercial validation of the Velocys technology. In May we reported that Velocys received a “notice to proceed” action to commence manufacturing of the Fischer-Tropsch reactors and catalyst for the Red Rock Biofuels biorefinery that will be located in Lakeview, Oregon, USA. RRB has commenced construction of the biorefinery, which will incorporate Velocys’ technology, and produce low-carbon, renewable diesel and jet fuel. Velocys’ role will be as a licensor for its technology to the project. RRB is a subsidiary of IR1 Group LLC, which has 325 million gallons of installed biofuels capacity. The biorefinery in Lakeview will convert forestry residue into 15 million gallons per year of renewable transportation fuels including diesel and jet fuel. Enough jet fuel will be produced by the plant to fuel 1,800 round trips per year from Portland, Oregon to San Francisco. RRB has in place contracts from several airlines to purchase 100 percent of the jet fuel produced each year. Last October we reported that Velocys signed an option on 100 acres near Natchez to develop a wood-based advanced biofuel facility that could also be upgraded to aviation biofuel. The company plans to invest hundreds of millions of dollars, so local authorities are lining up to offer it $42 million in county tax breaks, up to $15 million in state tax breaks, as well as $5 million worth of land and infrastructure upgrades from the county and local utility. Last September we reported that British Airways is jumping back into the MSW-to-aviation biofuel game with a new partnership, this time with Velocys who is already producing fuel with the proposed technology in the US. The project’s aim is to use hundreds of thousands of metric tons of household waste including diapers and plastic food containers to produce enough fuel to power all of BA’s 787 Dreamliner flights from London to San Jose, California and New Orleans. Last June we reported that Velocys CEO David Pummell said “Our new strategy is for Velocys to be at the heart of building plants that convert woody biomass to high specification renewable diesel and jet fuel for the US market, our primary focus market. We have a world class, proven technology and highly skilled operations and engineering teams that, with our partners, will successfully design, build, commission and start up these commercial plants. Our route to the production of renewable fuels from woody biomass uses cost effective, abundant and entirely sustainable feedstock, allowing our solution to be highly scalable to meet the increased demand for renewable fuels. All of this contributes to our differentiated value proposition to the market”. Q: To start with, why are you suspending operations at the plant and does it mean that operations will never recommence? A: We have announced that the Board of ENVIA has decided to suspend operations at the Oklahoma City plant and to undertake a review of strategic alternatives in order to preserve the value inherent in the facility. This decision was driven by financial circumstances following a leak at the plant which we announced several months ago. ENVIA’s appointed insurance company has independently confirmed that the leak was not the result of any flaw in our core technology, nonetheless the incident was a setback. During this period ENVIA has been operating the plant at reduced capacity using a single reactor to generate products, but in this configuration the plant does not meet the specific process energy requirements applicable under its RFS pathway to generate RINs, which further exacerbates operating losses. Following careful consideration of the facts, projections and available financing, the ENVIA board decided to suspend operations at the facility. We fully support the ENVIA board’s decision given the likely capital requirements of the plant and believe that Velocys’ capital is better invested in progressing our two biorefinery projects in the US and UK, which have the potential to generate significant value for our shareholders. We are focused on finding a strategic alternative that will preserve the value inherent in the facility and we intend to provide additional updates as appropriate. Q: Why resort to a shutdown? Why not continue to operate the plant while the insurance settlement plays out? A: There is simply too much uncertainty around the timing and the potential amount of the insurance settlement. The projected costs required to get the plant to sustainable cash generation is likely to be many millions of pounds. It’s simply not a prudent business decision to do this, when we have much more significant opportunities with our next plants in the US and the UK. Q: Let’s talk about those other plants. How will this affect the process to find a strategic investor in the MS project? Will it impact your UK facility? A: We don’t believe this decision will negatively impact prospects for our planned Bayou Fuels or our UK facilities. A significant amount of learning has been taken from ENVIA and the design of our US and UK plants are very different. We will use process technologies which are superior, carefully chosen and designed to meet the process requirements for these new plants. Most importantly we will engage EPC’s that have the right experience, standards and track record of delivery. In addition, we have generated significant amounts of data and demonstrated successful operation of our F-T technology from commissioning and start-up through full commercial operation. We’ve produced fuel that qualifies for the highest level of credit from the US government. All of this is critical to taking the next steps in our planned facilities. Q: What do you say to investors or others who will call this a failure? A: First, we don’t consider the ENVIA project a failure by any means. We achieved significant milestones and learnings that demonstrated that our technology can operate at commercial scale. The setbacks we encountered were unfortunate, but common with new technology development. Probably the single most important learning from ENVIA is the importance of selecting the right EPC. We joined ENVIA initially purely as a licensor of our technology and so we had no influence on the selection of Ventech XTL Oklahoma City, LLC, as the EPC nor access to assessing the detailed plant design and the specifications for the unit process operations in the plant. What was evident, is that the design and engineering execution by Ventech created many operational issues that led to significantly more capital to be invested and considerably longer timeline to get the plant fully operational. Many of the issues were resolved or work around solutions found, but the reactor leak incident had the root cause of a poorly designed ancillary coolant system. We must now deal with the reality of the situation. This decision was difficult, but it is the right financial decision for Velocys, now that we have collected our valuable commercial scale data for our technology. Finally, the operation of the ENVIA plant for over two years without a lost time accident speaks to the culture of quality and safety which are fundamental to Velocys and the operational leadership we provided the ENVIA plant. We can now fully direct capital and teams on our Mississippi and UK projects, where we are in the position to leverage our teams’ extensive experiences across engineering, technology, operations and project management. Q: What is the financial impact on Velocys? A: As we said during our recent fundraise process, we intended to set aside funds to continue to operate ENVIA during the claims process – and those are still being deployed. There are already funds set aside by ENVIA to use to fund a wind-down, should that be necessary. Additional funds could be required to achieve the best net return to Velocys, but these would be small and only deployed if this resulted in delivering greater asset value. In the long term, this means we have essentially eliminated the uncertainty surrounding the need for additional, potentially significant, funding. By taking these steps we ensure that we will no longer need to continue supporting the facility, and we can turn our full efforts and capital to our two planned facilities. We expect to communicate additional details in due course, likely in conjunction with our interim reporting during 3Q18. Q: What about lost revenue from the plant? Won’t that negatively impact the balance sheet? A: While we had been projecting that ENVIA would become cash-flow positive during 1H 2018, prior to the leak incident, the reality is that we now simply can’t predict when that will be given the uncertainty around the claims process. What I can say is that even at cash-flow positive status, the plant is not likely to be a significant generator of financial returns. When we weighed the risk/reward profile of continuing to fund this plant with all the uncertainty around it, we determined that it was best to reallocate the funding to projects with bigger upside, now that we have acquired significant commercial scale operational data from the plant. Q: Did you know this was a possibility when you went out and raised the money? At the time of the fund raise the best information we had from ENVIA was that the insurance claims would be quickly resolved. The resolution of these claims has taken much longer than ENVIA expected and remains uncertain at this time. The inability to establish a reliable timeline for reactor replacement and operation was only recently made available to us by ENVIA. During our fundraise we clearly stated that proceeds of the raise would be used to continue to support the ENVIA project to the point where the Company understands the financial plan to restore the second reactor to operation and get the plant to sustainable cash generation which we have just now become aware of. Q: What do you say to those who are extremely concerned about the share price? A: I say to them that we understand their concerns. I believe the steps we’re taking today are the right ones because they will remove uncertainty around the ENVIA plant and enable us to put all our efforts into our US and UK plants. I believe we are making fiscally prudent decisions because they will strengthen our balance sheet in the near term and better position us for success in the long term. The data we have taken from the plant is an extremely valuable asset to the Company and will be essential information that will support the successful delivery of our US and UK projects. Q: What do shareholders have to look forward to? A: Let me use this as an opportunity for a quick update on our three key projects. First, our Mississippi biorefinery project remains on track. In fact, we recently announced that we obtained a ‘Finding of No Significant Impact’ from the U.S. Department of Agriculture on the project’s Environmental Assessment report. This is a key regulatory milestone for the further development of the site and we believe it reflects the quality of our design and overall approach. In the meantime, we continue with our process to secure the necessary development capital investment by one or more strategic partners. We have a number of extremely attractive strategic investors who have joined the process and have begun their detailed due diligence on the project. This process will lead to a commercial deal with one or more of these investors and I hope to have news for you on that before the year is out. Second, the UK waste-to-renewable jet fuel plant project is also progressing to plan. We announced recently having received £434k from the Department for Transport (DfT) under the Future Fuels for Flight and Freight Competition (F4C), as part of an overall £4.9m funding from project partners. We were very pleased that Shell joined us and British Airways as project partners. Pre-FEED work on the project is ongoing and we plan to announce a site location in the coming weeks. Third, the Red Rock Biofuels’ project is continuing on track with its biorefinery project. We participated in their ground-breaking event several weeks ago and we wish them all the best for continued successful development. Last, I do want once again thank all of our shareholders for your support. Please know that the entire team is working tirelessly to bring our next projects online and begin delivering on the future that we all believe is possible.